It is the first time I post so many vegan dessert recipes in a raw, but indeed – it seems like they find me by themselves. 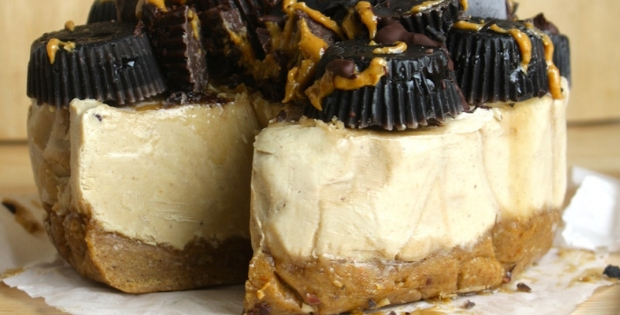 And how can one ever resist peanut butter and cheesecake put into one? If you are looking for a depression-buster, a show-stopper, a massively delicious, satisfying, lip-smacking, finger-licking dessert you won’t be able to stop craving. EVER. This is it! It’s delicious, appetizing, and with a layer of soft banana and cashew blend. Peanut butter on top and chocolate to cover the bottom, what more can you ask for? Every bite is a delight to deep satisfaction. For 928 more recipes that will excite your tastebuds and make your mouth water, Download 928 Tastiest Vegan Picks – the BEST AND BIGGEST vegan recipe collection online. Each recipe is hand-picked from the world’s best cookbooks.